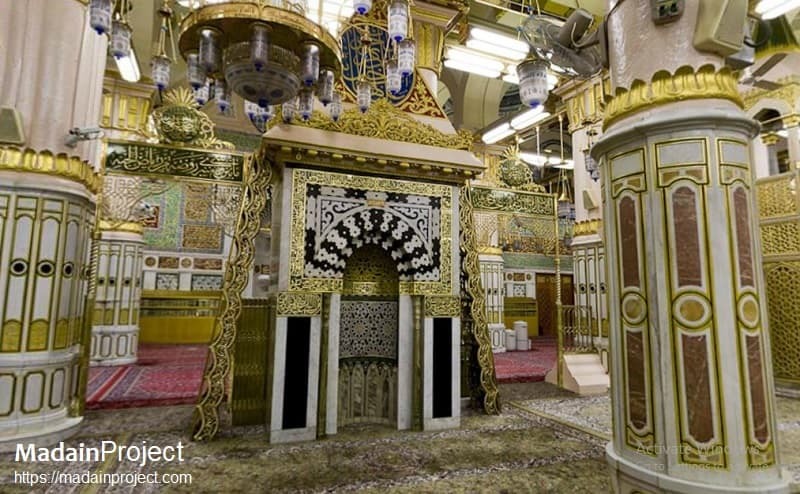 The Mehrab Nabawi is richly decorated and ornated with calligraphic inscriptions from Quran, a hadith and two dedicatory inscriptions on it's facade and rear. The calligraphy on prophet's mehrab is in Thuluth script, engraved in teakwood and plated with gold. Mihrab-i Nabawi and the Musallah as seen from the north, it dates back to the abu al-Nasr Qaitibai's era, 1482 CE. There are a number of calligraphic inscriptions on and around the facade and rear of the prayer niche, including 3 verses from Quran and one instance of Durood encircling the crown of the mehrab e Nabawi. On the posterior wall of the mihrab are the historic dedicatory inscriptions of five lines written in the Mamlooki Thuluth script. Close up of the Ottoman cupola over the Mehrab of Qaitibai, bears a circular inscription of Quran's verse from Surah al-Imran verse 37; (كُلَّمَا دَخَلَ عَلَيْهَا زَكَرِيَّا الْمِحْرَابَ). The verse speaks about the visits of prophet Zakariyya to Mariyam mother of Isa, that whenever he used to approach her, he always found her with provisions. Starting on the right bottom side is Bismillah followed by 144th verse from Surah al-Baqarah is written (identify), continuing towards the top and then towards the center. From the top enter towards the left and then again towards bottom is the verse 56 from Surah Ahzab (identify). From top third is the Durood continuing towards the bottom (identify). Below the crown the 112th verse from Surah Taubah is inscribed continuing within the inner curve of the mehrab and ending at the left out edge of mehrab (identify), followed by Sadaq-Allah (identify). The two inscriptions in the middle of the prophet's niche are the lowest of all inscriptions. Towards the right is a marker inscription, which reads; "This is the musallah of the prophet of Allah" (identify). Towards the left is one of the hadith (saying of prophet Muhammad), which reads; "Nabi Said, 'Salah (prayer) is a mainstay of Iman'" (identify). A dedicatory inscription (identify) on the rear wall of the prophet's mehrab. This inscription has two parts, one; top five lines and, second; lower three line. The top five lines read; (1) ”In the Name of Allah, Most Gracious, Most Merciful, and Peace be upon our leader Muhammad; (2) This Noble Mihrab has been placed in the prayer place of the Prophet by order of the Humble Slave (of Allah); (3) the Sovereign Ruler, al-Ashraf; (4) Abu al-Nasr Qaitibai. Allah is Eternal and Supreme; (5) In the month of Dhu al-Hijjah (of the Sacred Months), in the year 888 Hj.” The lower three lines read; (6) Its renovation was ordered by His Majesty; (7) King Fahd bin ‘Abdul ‘Aziz al Sa’ud; (8) Who Glorifies Allah, in the year 1404 Hj.